The First Ever Nike LGBT Sports Summit: Challenging Athletes to "Be True" and "Be Champions"
As I packed my bags for the Nike LGBT Sports Summit last month, I felt as though I was preparing for the "ball" of my dreams. iPad? Check... Running sneakers? Check... LGBTQ Pride? Double check! I could not believe I was headed to Nike Headquarters in Portland to represent Our Group Athletes, a national network that serves to empower and educate on behalf of LGBTQ student athletes and allies. 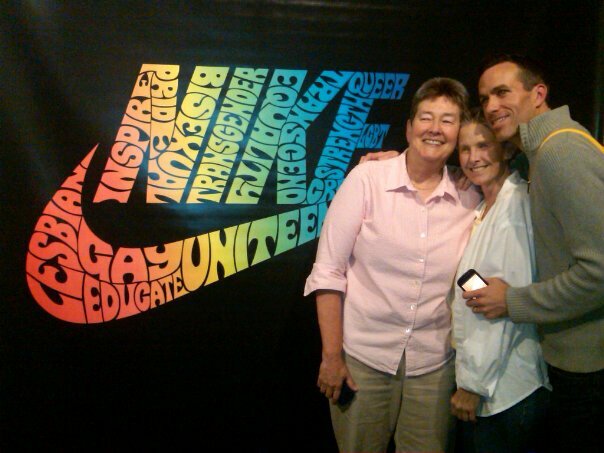 From June 14th to June 17th, the Nike LBGT Sports Summit brought together some of the most visible advocates for lesbian, gay, bisexual, transgender, queer (LGBTQ) acceptance in sports. The Summit had an incredible list of attendees, including Outsports.com's persons of the year Helen Carol and Pat Griffin, professional rugby star Ben Cohen, transgender advocate Kye Allums, ESPN commentator LZ Granderson ,and dedicated ally advocates Patrick Burke and Hudson Taylor. I was beyond excited, and even a little nervous, to be attending an event of such magnitude. At the University of Pennsylvania, my track team was sponsored by Nike, meaning all our gear was labeled with the famous Nike "swoosh." When I was in college, I could only dream of the day that my school's brand would host one of the most historic events of Pride 2012. Although our nation has witnessed a dramatic shift in cultural attitudes towards the queer community, sports is still regarded as the "final frontier" of the LGBTQ movement due to the relatively small number of "out" coaches and athletes. Instead of "Just Do It," Nike headquarters in Portland celebrated Pride with the tagline "Be True" plastered in rainbow lettering all over the city. Walking down the streets of Portland during Pride was like a rainbow-coated dream come true. Throughout my days at the LGBT Sports Summit, I felt profoundly accepted for exactly who I am, both as a dedicated track athlete and a proud member of the LGBTQ community. Aside from feeling accepted, I was thrilled to be a part of this "team" of LGBTQ advocates at the Sports Summit. Just like any good team, we were a diverse group of players, unified with a common desire to "win" by fighting homophobia, transphobia, and bullying in sports. After four days of intense meetings and discussion, we made a game plan for the future: our goal over the next years would be to redefine "athletic champion" in order to promote LGBTQ acceptance in athletics. It wasn't until my flight home that I realized how much Nike's Pride slogan "be true" is also what it means to be an athletic champion. A champion, is true to themselves, true to their sport, and true to their teammates, coaches, and fans. A true champion is not afraid to lead and stand up for what it right. An athletic champion is an ally, and an athletic champion is also an out athlete. On the final day of the Summit, the participants were invited to walk in the Portland Pride Parade. Despite the fears that anti-gay consumers may refuse to buy Nike products, Nike boldly hosted this unprecedented LGBT Sports Summit and encouraged its employees to proudly march in the Pride Parade. With the music blasting "Call Me Maybe" and "What Doesn't Kill You Makes You Stronger," I felt a surge of energy from the crowd as our rainbow-Nike truck passed by. Families of all types, people of all ages, and residents decked out in a multitude of colors and styles, were all together celebrating this historic moment in LGBT history. Having one of the most recognizable brands on the planet host the first LGBT Sports Summit symbolizes how far our movement for equality has come within the past year. It's only a matter of time before other athletic companies across the world follow Nike's champion-like lead and visibly support our nation's LGBTQ community and allies. With Nike's catchy tagline in mind, I challenge you to "be true" to whatever sport, sexual orientation, gender, and dream that rings "true" to you. Individually, you can be a champion -- either by being out yourself (if you are L, B, T, or G) or supporting your out teammates (if you are an ally). The LGBTQ movement, now more than ever, needs us to be brave about who we truly are. Now is the time for athletes to be true, be champions, and join us as we make history together.